Viewing time: 3 mins. 37 secs. The Write Question is a weekly video podcast all about writing. Today’s video gives advice on how to speed up your free writing. Welcome to The Write Question, I’m Daphne Gray-Grant. 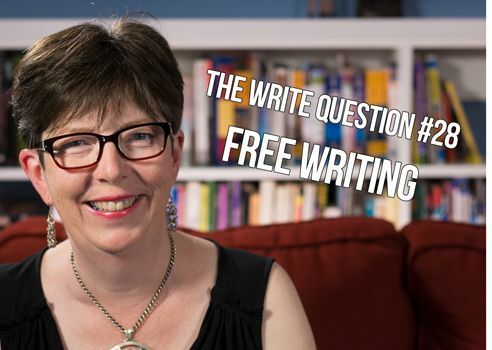 Today we’re talking about the free writing — and the unexpected cost you’ll sometimes pay for it. I find I have to do a lot of free writing before I can figure out the thesis to any paper I need to complete. But to help me think, I need to write, a lot. If I have a 2,500-word paper to write, I might write 1,500 words or more of, essentially, free-writing, before I figure out a thesis. The struggle in my academic writing comes in the teasing out what I’m asked to write about from all the reading I just finished. Can you suggest a way to make this process faster? Thanks for the question, Nicole. To free write, you write continuously for a predetermined amount of time without any regard for spelling, grammar, or even subject matter. It’s a technique popularized by Julia Cameron and is not intended to help you figure things out. Instead, it’s meant to give yourself a chance to vent and to spark your creativity. If you don’t know anything about free writing, you should have a look at another video where I talk about it. I’ve provided the link to it below. But I don’t think you’re actually doing what’s called free writing. Instead, I believe you’re practicing what some might call “exploratory writing” or even “experimental writing.” With this kind of work, you’re trying to figure out your point while you do the writing. I’ve noticed that many academics use this kind of approach and — I’m sorry to say this — but I think it’s a bad idea. The work of writing — and editing — all those sentences add up. This is very time-consuming – you even acknowledge that yourself. It’s not surprising you’re getting frustrated by the process. Instead of writing to figure out what you think, I suggest you just, simply… think. Go for a walk, get away from your desk and let the ideas percolate at the back of your brain. You don’t have to write things down to figure them out. You just need the time and space for thinking. Then, AFTER you’ve done the thinking, go back to your computer and make notes. If you’ve done the thinking first, I know you’ll find the writing a lot faster and a lot easier. Here’s another idea if the writing you’re working on requires a lot of research: Keep a research diary. In this document, you should record more than just the findings of the research. You should also include your feelings about those findings. Do you agree with the other author? Why or why not? Remember, academic work is not just about regurgitating what others have told you. It also requires adding something new to the conversation – your opinion. If you force yourself to record your opinion every day, you’ll get better at producing it. And, best of all, you’ll avoid writer’s block. Thanks for your question, Nicole. Good luck with reducing the amount of time you spend writing and increasing the amount of time you spend thinking.